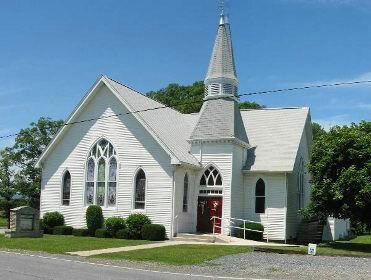 In 1757, a Lutheran Church was organized at Tom’s Creek with the Reverend George Bager as Pastor. One acre of land was purchased to be used as a cemetery and church property. A log church was erected on the west end of the lot. The Lutherans and Reforms continued to use the church until 1797. In 1797 the Lutheran and Reform congregations at Tom’s Creek built the present Lutheran Church in Emmitsburg. The Methodist congregation under William Moreland purchased the old log church near Tom’s Creek from them. They continued to worship in this same building until 1904. Under the leadership of Reverend George W. Harris, a new church location was selected approximately two miles from the old site at the intersection of two important roads. A parcel of land was purchased from Elias Valentine for $25.00. A portion of the adjoining woods was given the Church by James Troxell for use as a parking lot. In April, 1903 following a service in the old church, the ground was broken for the new building. The cornerstone was laid in August, 1903. A small box containing Sunday School and Church papers, coins, the Carroll Record and names of the church members was sealed within the cornerstone. The new Church was dedicated in May, 1904, with services in the morning, afternoon, and evening. Reverend B. F. Clarkson, the District Superintendent, was the principal speaker. He was assisted by Reverend George Harris, the regular pastor, and Reverend Osburn Belt, who had served as the circuit pastor twenty years prior to this time. Today, Tom’s Creek United Methodist Church continues to serve its members and the surrounding community.